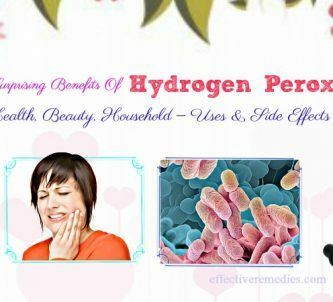 Why Is It Used For Health & Beauty? How To Use It For Hair And Skin? Side Effects Of Shea Butter? 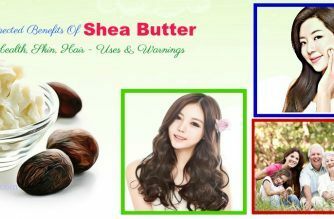 If you are searching for a great natural product for your health, hair, or skin, then Shea butter is an ideal choice. Rich in vitamins and moisturizing, revitalizing and nourishing effects, Shea butter is universally used in various skin cosmetic products and creams, and it can deliver numerous benefits to your hair, skin, and health. 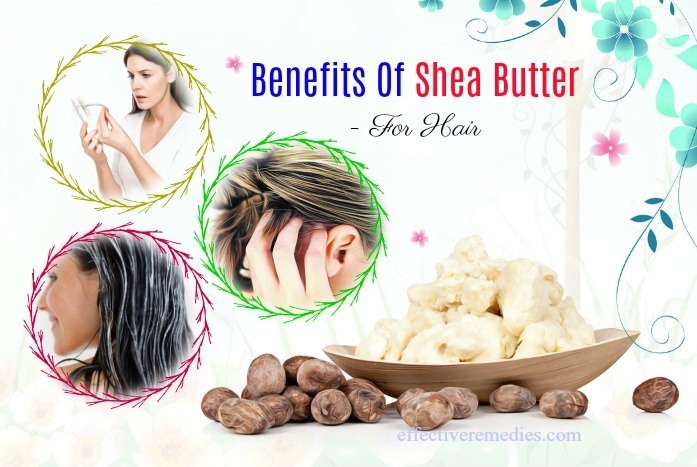 In this article on Effective Remedies, you will discover about the unexpected benefits of Shea butter for health, skin & hair, its nutritional value, its uses, its warnings, and much more. It’s fat, which is extracted from the nuts of the Shea tree. This tree is found mostly in West and East tropical Africa. This butter is composed of stearic and oleic acids, which have multiple effects on human health. 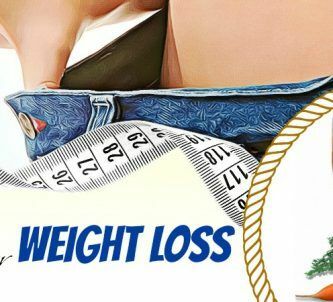 This rich fat is typically found in chocolate recipes and cosmetics in North America and Europe. Also, it’s used as an ingredient in foods in other areas of the world. Shea butter comes in different forms, such as unrefined, raw, and organic. Why Should You Use Shea Butter For Your Health, Skin & Hair? This ingredient is commonly used in creams, lotions, moisturizers, and other emulsions for the hair and skin. It contains a high content of fats, which make it a perfect skin moisturizing agent and emollient. Besides, it also embraces antioxidants and anti-inflammatory properties, all of which help to soothe inflammatory skin disease and treat the damaged skin and hair . Other than that, it is full of vitamins A and E, which keep your skin in optimal health and give it protection from being damaged due to the harmful ultraviolet radiation of the sun. Plus, vitamin E is helpful for soothing dry skin and improving the skin’s elasticity. Phenolics: Shea butter consists of ten phenolic compounds, eight of which are catechins. Fatty Acids: Shea butter holds five principal fatty acids namely stearic, palmitic, oleic, arachidic, and linoleic acids. Vitamin A & F: These vitamins found in shea butter can aid in treating skin conditions such as dermatitis, eczema, and even reduce premature aging. Vitamin E: Vitamin E or tocopherol is also found in Shea butter. Shea butter is regarded as one of the superfoods for the skin because it is powerhouse of unsaturated fats, essential fatty acids, phytosterols, provitamin A, vitamins E and D, and allantoin. This ingredient has been used for baby care, skin care, and consumption since time immemorial. 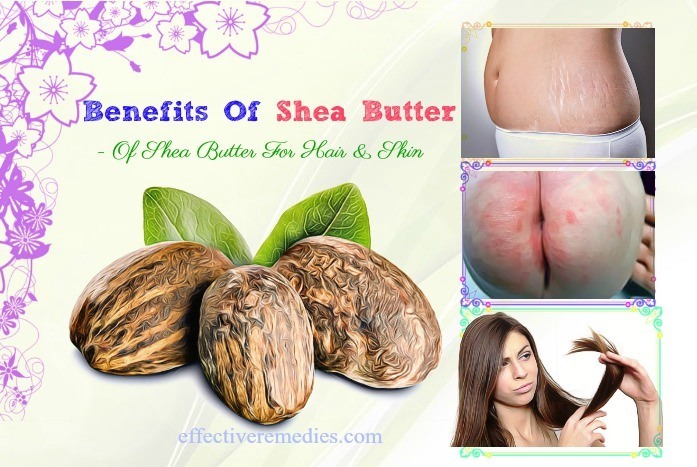 Shea butter is used effectively for treating various health issues. Let’s check out! Shea butter is used for food preparation by lots of people in Africa. Adding this ingredient to your diet can assist you in reducing cholesterol level in the blood. According to a study, Shea butter contains a type of saturated fatty acid named stearic acid, which was shown to lower bad cholesterol . Rheumatism is characterized by inflammation, joint pain, and stiffness. The swelling and pain can be present in the fibrous tissue or muscles. Shea butter can alleviate the pain and swelling caused due to rheumatism. More importantly, its anti-inflammatory properties play a vital role in fighting rheumatism. Furthermore, it can be used as an ointment to treat muscle ache, joint pain, and bruising. Muscle ache results from inflammation in the problem area due to a muscular ailment or exertion. Shea butter has been used traditionally in Africa to eliminate muscle aches and soreness. Massaging Shea butter on the affected site will help reduce the swelling and pain. Shea butter possesses the anti-inflammatory compounds that can be helpful for reducing the inflammation and clearing your nostrils. A study shows that Shea butter can clear the congestion within a day . The next time you undergo nasal congestion, apply a little Shea butter in the nostrils with your finger. Shea butter contains skin moisturizing properties and healing agents. Therefore, regular application of Shea butter can heal cuts, wounds, and abrasions quickly. It also supplies the skin with the essential nutrients and fats. Moreover, it increases microcirculation and thus enhances the cell repair function. 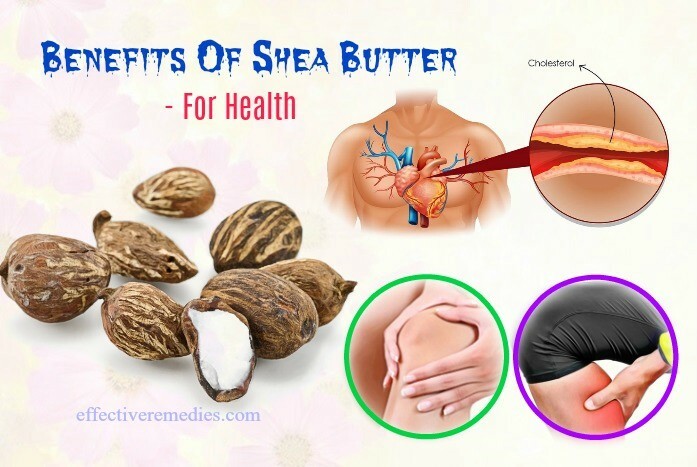 Shea butter is highly beneficial for promoting healing and disinfection and calming skin allergies such as insect bites and poison ivy since it is high in vitamin A. Along with that, it holds the anti-inflammatory and antimicrobial activities that work wonders in encouraging the healing process. 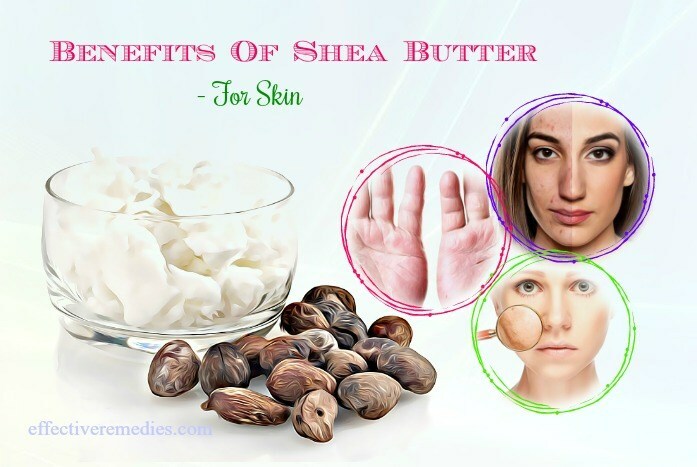 Shea butter is a magical product for skin care. Here are some of the best benefits of Shea butter for your skin. Shea butter is perfect for preventing and treating acne. Moreover, it helps to lighten and decrease the appearance of scarring and redness related to acne. Along with that, raw, unrefined Shea butter can cure skin rashes, scars, stretch marks, skin peeling after tanning, frost bites, burns, insect bites, and athlete’s foot. Shea butter is a great choice for people suffering from dermatitis and eczema. Many products used to alleviate eczema or dermatitis has Shea butter as a basic ingredient. Regular usage of Shea butter is excellent for reducing the dryness, scaliness, and itching associated with dermatitis or eczema, as it is laden with moisturizing effects. Shea butter comprises the moisturizing and anti-inflammatory abilities, both of which are beneficial for itching skin . Dryness can cause the skin to begin peeling or become flaky. Thankfully, the moisturizing fatty acids found in Shea butter help provide relief by giving the oils to the skin. Furthermore, the anti-inflammatory agent of Shea butter works well to ease the itching due to psoriasis. Environmental factors such as extreme temperatures, pollution, and sun damage can affect the appearance of aging in your skin. Shea butter is one of the best anti-aging properties for the skin. Plus, it aids in stimulating the collagen production. Apart from that, it keeps the skin supple, radiant, and nourished owing to its vitamins A and E. If used regularly, Shea butter will assist in reducing wrinkles and preventing premature fine lines and wrinkles. Other than that, its anti-aging agents can increase circulation to your skin and enhance cell renewal. Shea butter helps to maintain the skin’s elasticity, as it is rich in vitamin F and the non-saponifiable matter. It additionally aids in restoring the natural elasticity of the skin by improving the collagen production. Besides, it also hydrates, softens, and beautifies the skin. With restored elasticity, the appearance of blemishes and wrinkles also reduces. Shaving hair with razors can leave the skin itchy and irritated. Shea butter can help decrease the bumps by moisturizing and soothing the irritated skin. You can apply some butter a day before shaving to help smoothen the hair and skin. This way makes the shaving procedure easier and faster. Shea butter provides the lips with extra moisture and nutrients during the dry weather conditions and cold season. It also functions as a natural lip balm and is ideal for treating chapped and dry lips. When applied to the lips, it creates a barrier on it and restores moisture in the skin. Shea butter is ideal for calming down pain and inflammation that result from sunburn because it is loaded with antioxidant and vitamin E content. It further gives low-grade UV protection, particularly when mixed with coconut oil. It also gives the skin protection from harmful UV rays. Apply Shea butter about twenty minutes before stepping out in the sun. Due to its fatty acids, Shea butter helps condition the hair and scalp. It further supplies many essential that can improve the scalp and hair health that in turn makes the hair follicles stronger and decreases hair loss and hair fall. Its anti-inflammatory properties are also useful for preventing hair loss. Using Shea butter frequently will make your hair grow thicker. Shea butter works well on easing an itchy, dry scalp or dandruff. As we mentioned earlier, Shea butter comes with rich fat and anti-inflammatory agents, which get absorbed into your skin without clogging the pores and leaving an oily residue behind. Therefore, it provides relief from scalp psoriasis, dry scalp, and other scalp issues. Shea butter is filled with essential fatty acids and vitamins A and E, which help to add moisture to the hair. It also reduces dryness and prevents split ends. The fatty acids also aid in increasing shine and lowering the frizz of the hair. Apart from that, it also protects the hair from heat damage caused due to blow drying and flat irons. As per studies, Shea butter includes remarkable anti-inflammation agents, which can penetrate deeply into your skin to ease inflammation. It’s also good for restoring weakened hair follicles, thus giving a healthy environment to promote hair growth. When applied to the scalp two times weekly, Shea butter helps to enhance healthy hair growth and improve overall scalp health. Overexposure to the sun can dry out the hair and lower its strength and natural elasticity. Plus, too much sun can damage the hair follicles and cause the hair color to banish. Shea butter can remove some of the harmful UV rays owing to its cinnamic acid. When applied to your hair before swimming, it can fight the damaging effects of chlorine and salt. Furthermore, it also works as a barrier to protect against air pollutants. Shea butter enhances the recovery procedure of split ends because it is packed with anti-inflammatory activities. You can pick up the step by step recipe by clicking at the Split Ends Remedy No.5. Regular application of Shea butter will assist in keeping your skin healthy and healing any damaged cell. Please view at the Stretch Marks Remedy No.6 to get the specified recipe. Shea butter is filled with vitamins A, E, and F, which work wonders in soothing dryness, restoring split ends, and decreasing breakage. You click at the Damaged Hair Remedy No.20 to learn more about the detailed recipe. Owing to its anti-fungal and anti-inflammatory abilities, Shea butter helps the battle yeast. It eliminates diaper rash while preventing its future occurrence. For the particularized recipe, you view at the Diaper Rash Remedy No.8. The fat acids present in Shea butter can keep your skin more elastic. It also tightens the skin and fades the dead skin cells. Please view at the Chubby Cheeks Remedy No.8 to attain the specific recipe. You can quickly combat the problem of dry skin with the help of Shea butter. You click at the Dry Skin Remedy No.13 to obtain the detailed recipe. In one double boiler, melt all the ingredients excluding lavender and peppermint oil. Allow the mixture to cool down and add essential oils. Then, mix well and pour it into lip balm tins or small jars. Set it aside until its contents set. After that, use one or two times daily as a regular lip balm. Melt the Shea butter and coconut oil in one double boiler. Later, mix well and leave it to cool down for a few minutes. Then, add the almond oil and mix all the things well. Place the mixture in a refrigerator for 10 to 15 minutes. After that, whip the oil blend with the aid of a kitchen aid mixer or a hand mixer to have a thick, creamy consistency. Now transfer it to an airtight container and set it aside. Let it set and use it to moisturize the body as needed. Mix all the above items thoroughly until you get the required consistency. Start applying to your face with the help of your fingers. Keep the mask for 60 minutes before washing with cool water. Mix the Shea butter along with chopped avocado well to obtain a paste without lumps. Add some rose water to the mixture and mix again. Apply this mask to the face and leave it to rest for 25 minutes. Lastly, use warm water to wash the mask off and pat dry. Gently mix the above components and apply to your face. Let the application settle for ten minutes before washing with cool water. Finally, pat dry and use a toner to tone your face. Wash your hair with shampoo as usual. Take enough quantity of melted Shea butter and start applying to your hair. Massage gently for a few minutes. Comb your hair and evenly disperse the butter on it. After 30-45 minutes, rinse off using cold water. Melt some Shea butter over boiling water in a double boiler and leave it to cool down. Now take the required amount of myrrh essential oil, melted Shea butter, coconut water, and olive oil in a blender and blend them until you obtain a smooth paste. Apply this mask to your hair and rinse it off thoroughly after 30 minutes with lukewarm water. Firstly, crack an egg in a mixing bowl and mix well. Add the honey and olive oil to the mixture and stir until you get a frothy liquid. After that, melt down some Shea butter in one double boiler and let it cool. Add the tea tree essential oil and melted Shea butter to the mixture and stir well. Apply this resultant mask to your overall hair and rinse it with lukewarm water after half an hour. All you need to do is melting down Shea butter over boiling water in one double boiler and cooling down to room temperature. Then, apply to the scalp and lightly massage in a circular motion. After that, rinse with lukewarm water. Blend the flesh part of an avocado in a blender and then melt the Shea butter in one double boiler. Add the blended avocado, melted Shea butter and peppermint oil in a blender and blend these things well. Coat your hair with the mask and leave it to rest for 30 minutes. Lastly, wash the mask off using lukewarm water along with a mild shampoo. Apply some Shea butter evenly on the hair and wrap it in a warm towel. Leave your application for 20-30 minutes. After that, use lukewarm water together with a mild shampoo to wash your hair. Shea butter is probably safe when taken orally in quantities commonly found in foods. It is also safe when applied to the skin suitably. However, ingestion or topical application of shea butter can cause some side effects such as itchy rashes, hives, weakness, nausea, headache, abdominal pain, and dizziness. If you undergo any of these symptoms, you stop using Shea butter and check with a doctor. Other than that, using an excessive quantity of shea butter in your cooking can lead to weight gain or obesity, due to its high-fat levels. Pregnancy, breastfeeding, and children should consult a doctor before using Shea butter. You can buy organic and raw Shea butter online. Besides, some large department stores and organic stores may stock Shea butter in their hair care and skin care sections. Hope you found the post on benefits of Shea butter useful. Try using this wonderful ingredient and let us and other readers know how it helped you. Also, share with us if you know other amazing benefits of shea butter for health, skin and hair, its uses & side effects. All of the contents provided in this article are for informational and educational purposes. We recommend you consult a healthcare professional or a doctor before using it for any purpose.